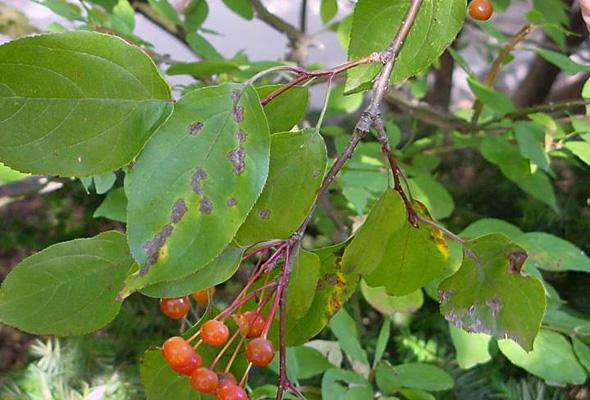 Apple Scab Disease is caused by the fungus, Venturia inaequalis and it affects almost all fruit trees, including crabapples, purple plums, sand cherries and mountain ash trees. Disease development is favored by wet, cool weather that generally occurs in spring and early summer. 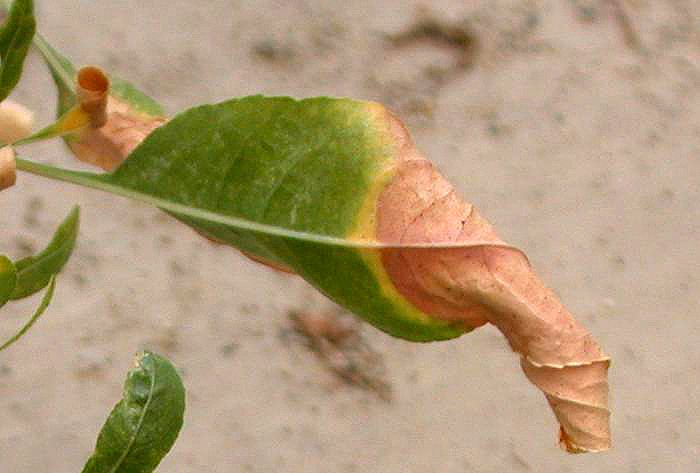 Both leaves and fruit can be affected. Infected leaves may drop resulting in unsightly trees, with poor fruit production. This early defoliation may weaken trees and make them more susceptible to winter injury or other pests. The disease causes scab-like lesions on the leaves, causing them to brown, curl and fall prematurely. 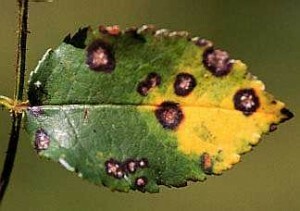 The infected leaves, when left on the ground, re-infect the new growth in a continuous cycle throughout the season. The disease is most severe during a cool, wet and windy spring. In the spring, the fungus in old diseased leaves produces millions of spores. These spores are released into the air during rain periods in April, May and June. They are then carried by the wind to young leaves, flower parts and fruits. Once in contact with susceptible tissue, the spore germinates in a film of water and the fungus penetrates into the plant. Depending upon weather conditions, symptoms (lesions) will show up in 9 to 17 days. A timed, early spring and summer spray schedule is critical to managing the disease and will restrict the spread of apple scab lesions, helping the tree to maintain its aesthetic beauty. Regular pruning is also needed to control the disease, by allowing proper air flow through the tree. Any fallen leaves should be removed immediately. Diplodia (Tip Blight) dead, brown needles at the tips of pine branches may signal the presence of Diplodia tip blight. 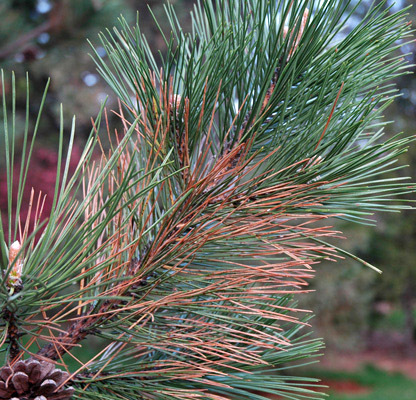 Surveys indicate that no species of pine (Pinus) is immune to this disease, although some species are more severely affected than others. Austrian pine (Pinus nigra) is one of the most severely damaged species. 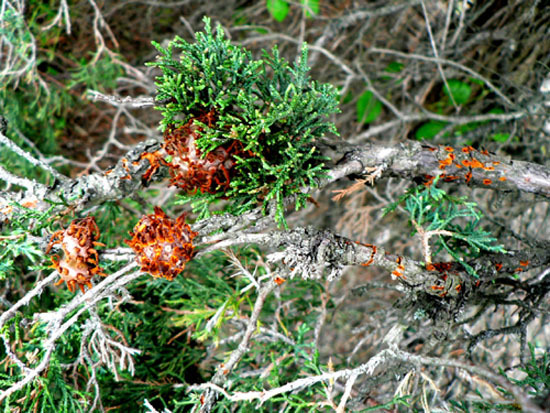 Tip blight infection year after year can weaken and even kill large Austrian pine trees. 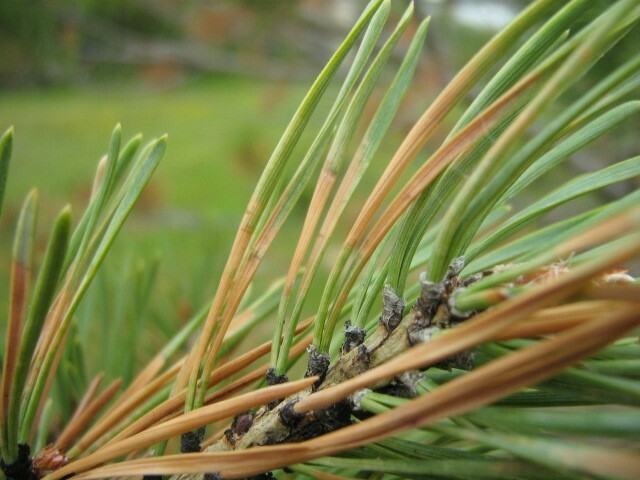 Douglas-fir, white, Norway, and blue spruce may also be infected, but infection of these species usually develops only on trees that are injured or stressed and when infected pine are nearby to provide a source of inoculums (spores). The fungus which causes tip blight of pine trees is Sphaeropsis sapinea (also known as Diplodia pinea). This fungus is present throughout the year in dead needles, leaf sheaths, twigs, and cones located either on an infected tree or on the ground. Small black fruiting bodies mature during late spring or early summer in this material. The brown oval spores ooze out of the fruiting structure during wet conditions and are scattered by wind, splashing rain, animals, or pruning equipment. Some spores land on young needles of the current season’s growth. After the spore germinates, the fungus enters the needle through a stomata (or pore) and grows toward the base of the needle. A few hours later, a brown area develops near the point where the fungus entered the needle. By this time, the fungus has grown into the twig. The progressive invasion of the twig by the fungus results in browning of the attached needles and canker production in the twig. The damage caused by this disease is most severe on old or weakened trees. Old trees or trees exposed to unsuitable growing conditions, mechanical injury, or damage by insects may eventually be killed. 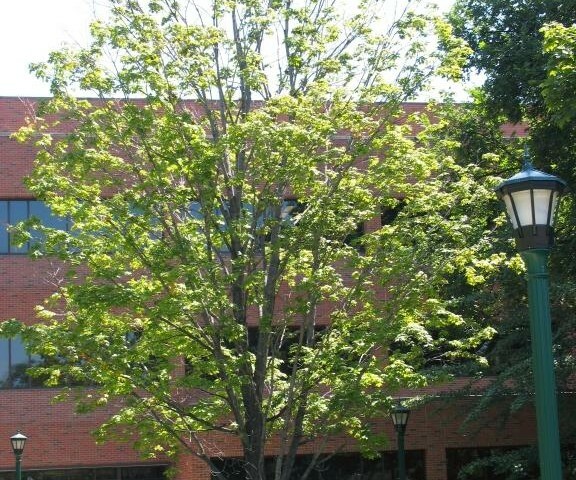 Thorough weekly watering during extended dry periods of the growing season and spring broadcast fertilization will result in a tree that is more vigorous and more resistant to tip blight. 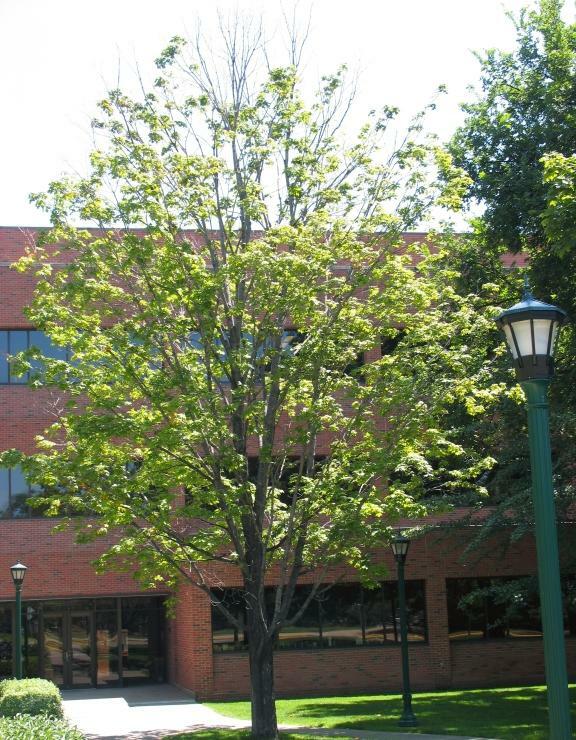 When only a few branches of a tree show symptoms of tip blight, a program of pruning, sanitation and fertilization should help minimize disease. Prune off blighted twigs and destroy or discard them. Since fungal spores can be transported to healthy twigs during the pruning operation, prune when the tree is dry. Where disease is severe on smaller landscape trees, applying some fungicides will help to minimize new infections. 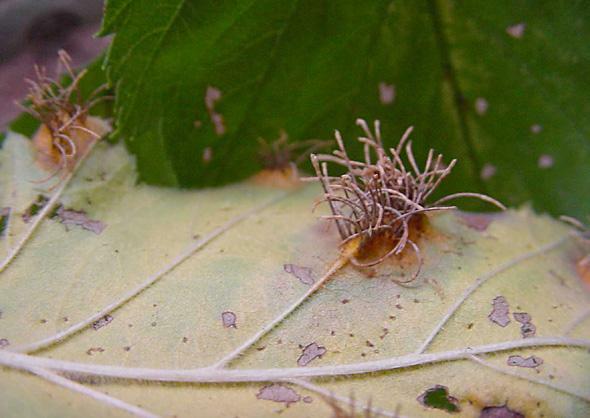 Hawthorn Rust most often infects leaves and may lead to premature leaf drop. The bright yellow spots can make an entire plant appear yellow. Hawthorn rust may also form spindle-shaped galls on shoots. Disease prevention and control is the key to effective control. A program of hawthorn rust management is made up of two primary components—protective fungicide treatments and selection of disease resistant varieties. Elimination of juniper from an area can reduce disease but is neither a realistic nor desirable practice in urban landscapes. Close placement of the two hosts can, however, increase the severity of the disease. When dealing with susceptible hawthorn varieties, properly chosen and timed fungicide treatments will do an excellent job of managing rust diseases, keeping your plants healthy and attractive. 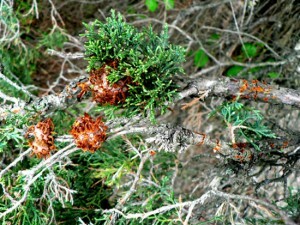 Needle Cast is a fungus that affects conifer trees causing infected needles to become discolored and die and eventually be cast from the tree. Begin scouting for this disease in early April before bud break. Scout on slightly overcast days as opposed to sunny ones, as it will make the discoloration of the needles stand out much better. Examine needles near the base of the tree first, as this is where infection is most likely to occur. Infected needles will have one or more purplish-brown bands or spots, which are evident on both the upper and lower surface of the needle. Usually just before bud break, the banded areas will begin to swell and split open lengthwise on the undersurface of the infected needles, in preparation for releasing infectious spores. Once the fruiting bodies rupture, spongy, orange, spore-bearing fungal tissue will protrude from the undersurface when conditions are damp. When this tissue begins to turn black, spore production and dissemination is complete. Three fungicide applications are generally recommended. The first should be made when at least 50% of the buds have broken and the new growth is 1/2 inch long. Make two more applications at two to three week intervals after the first. To help prevent the spread of this disease, plant where there will be good air drainage, and keep properly pruned to encourage airflow between the trees.